Painstakingly handcrafted and patterned after the coffin of Egyptian priest Nakhtefmut, this mummy case stands guard outside the Hugh Nibley Ancient Studies Room in the library. By his early 50s Jeffrey V. Kulesus (BA ’77) had accomplished everything on his bucket list—except learning violin and building an Egyptian mummy case. 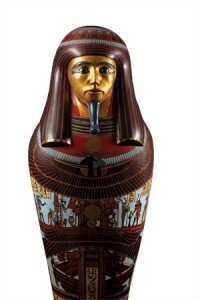 So he went to work crafting the case, patterning it after the coffin of Nakhtefmut, priest of the god Amun. “There were no instruction manuals on how to make one,” Kulesus says. He experimented by soaking cloth in plaster and gesso to form cartonnage, a material used anciently to fashion the shell. He wadded newspapers into a life-size mummy shape, applied the cartonnage, and added a smooth finish coat of plaster. Finally he painstakingly hand-painted hieroglyphs, using common ancient Egyptian colors. His project evolving in the garage sparked curiosity. “A neighbor noticed he had not seen one of my teenage sons for a while and asked if the boy was inside the case,” quips Kulesus. The project also caught BYU’s attention. The mummy case, which took two years to craft, now stands outside the Hugh Nibley Ancient Studies Room on the fifth floor of the Harold B. Lee Library. A companion mummy case, patterned after that of Queen Neshkons, completes the living room décor in Kulesus’ Illinois home.